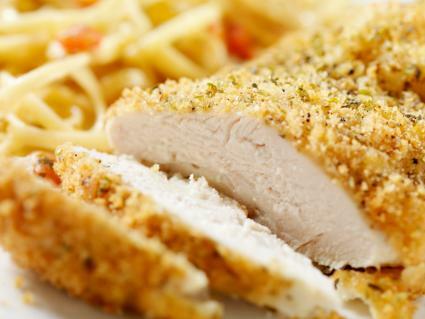 Prepare a delicious gourmet chicken dinner using Panko. Panko breading provides a great way to create a great-tasting chicken entrée that will please even the most discriminating of palates. This style of chicken preparation is a bit more upscale and special than basic grilling or broiling, yet isn't heavy like traditional fried chicken. Try your hand at making this tasty chicken dish in your own kitchen. This elegant chicken recipe is surprisingly easy to make and is also quite versatile. Spray a baking sheet or pan with non-stick cooking spray. In a medium mixing bowl, stir together Panko bread crumbs, garlic, parsley, salt and pepper. Melt butter using your microwave oven. Add mustard to melted butter, stirring well to combine. Lightly coat chicken pieces in butter/mustard mixture (either by dipping or using a pastry brush). Place coated chicken into Panko mixture, ensuring that a light layer of seasoned crumbs stick to both sides. Place chicken pieces in a single layer on prepared baking sheet or pan. Bake for approximately 30 minutes, ensuring that internal temperature reaches 160 degrees Fahrenheit. Panko chicken is a very versatile entree that can be paired with a variety of delicious side dishes. A few particularly good vegetable recipes to pair with this entree include grilled vegetables and sautéed asparagus. Tasty starch recipes that work well with this dish include mushroom risotto and scalloped potatoes. If you'd like to add something a bit unexpected to your meal, consider this spaghetti squash recipe. 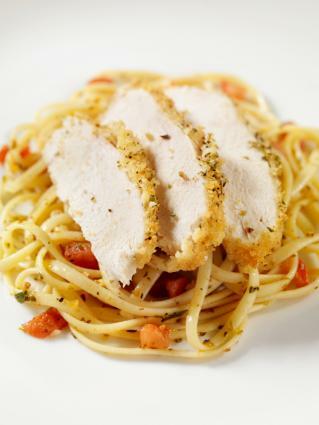 Serve slices of Panko chicken over your favorite pasta recipe for the ultimate in elegant simplicity. No matter what combination of side dishes you choose, add a salad and some store-bought or freshly-baked bread to complete your menu. You'll have a gourmet feast that is just appropriate for an elegant dinner party as it is for an evening meal for you and your family to enjoy.